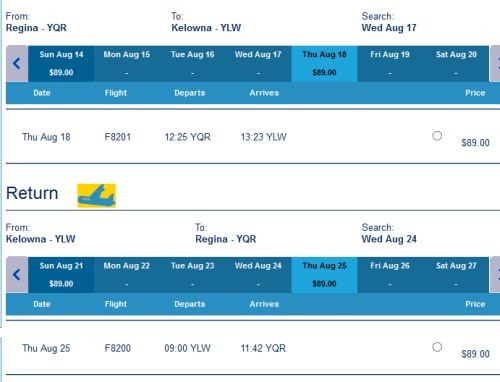 From Regina, New Leaf is only offering flights to one destination, and that is Kelowna, BC. Flight from Regina to Kelowna, BC are priced at $178 CAD roundtrip including taxes. The last time New Leaf launched, WestJet and Air Canada responded by dropping their prices. That's what competition does. Keep an eye on YQR Deals for word of them doing so again! 2. Search for a flight from Regina (YQR) to one of the cities listed above. Start with a date that is July 25 or later. Kelowna, British Columbia for $178 CAD roundtrip including taxes. Try Thu/Sun to Thu/Sun dates in very late July, August, September, and October 2016.
regina, yqr, flight deals, westjet, canada, british columbia, bc, north america, kelowna and newleaf.